Last year there was a post on this blog about a translation agency called myGengo. To find it, enter mygengo in the Search Box on the right. MyGengo's peculiarity is that it openly offers paid translation work to bilinguals who aren't trained or experienced translators – in other words, who are Native Translators. For this it pays the translators very low rates and charges customers accordingly. The translations are of a kind which it calls "simple human translation". It sees as its competitors not Professional Expert Translators but the machine translation services that are available on the web for free. 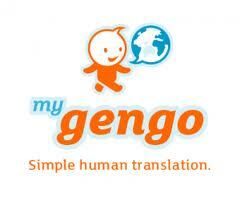 "Before myGengo, you could only get free, easy, but awful machine translation or expensive, slow, human service. We provide good quality human translation as simply as using machine translation - for very low cost." It's true that myGengo also offers more difficult translation work at substantially higher rates, but so do hundreds of other translation agencies. Its real niche is the "simple human translation." Things like personal messages and emails, perhaps. Indeed I think it may be a strategic marketing error for them to offer the more advanced level. They should stick to exploiting their niche. Trying to recruit both Native and Expert Translators leads to confusion and misunderstanding. "myGengo makes the translation industry a tougher jungle for the truly professional and skilled translators who find themselves put into face-to-face competition with unprofessional spare-time jobbers with little experience... As a professional translator I would never be willing to work for myGengo under such conditions." The other expresses anger at the way the writer was graded by myGengo as admissible to their Native but not their Expert level despite her nine years of Korean<>English professional experience. So both complainants are Professional and no doubt Expert Translators. I certainly wasn't recommending that Professional Expert Translators should apply for work to myGengo. As said above, there are hundreds of other agencies that offer their level of work. In fact it wasn't my purpose to endorse myGengo at all; I was asking a general question. Will this kind of service lead to a two-tier market? Because I do believe there's a need for it. Anyway, perturbed by these criticisms, I decided to conduct my own experiment. In fact, two experiments. In order to do so anonymously and avoid favoured treatment, I adopted a new name and email address. Under this disguise, I first submitted two short texts for translation from Spanish to English as a paying customer. One of them was an email from a colleague, the other a telephone company advertisement. They were communications I'd actually received, with small redactions. They totalled about 300 words. The translations came back fast: in a bare four hours. I don't have space to reproduce both of them, but here, for the benefit of those of you who know Spanish, is the email. Tal y como te dije por teléfono, creemos que eres la persona más adecuada para revisar un artículo que vamos a enviar a una revista. El artículo lo hemos elaborado entre tres personas y creemos que, en algunos apartados, se puede notar la diferencia en la redacción. Además de revisar, nos gustaría que corrigieras lo que creas oportuno y que nos des tu opinión, por favor. Yo estaré "localizable" hasta el día 29, aunque el próximo lunes y martes no voy a estar. Muchas gracias por acceder a realizar esta tarea; ya se que el enero no es la mejor fecha para pedírtelo. Just as I said on the phone, we think you're the right person to revise an article we're going to submit to a magazine. Three people have worked on the article and we think there are parts where stylistic differences are obvious. In addition to revising, we'd like you to make any appropriate corrections and give us your opinion. I'll be available until the 29th, but I'll be out next Monday and Tuesday. If there are any problems with the format, let me know and I will send you a copy compatible with Word 97-2003. Thank you very much for agreeing to do this for me, since I know January isn't the best time to ask you. I judged it to be very satisfactory. The meaning is clear and accurate; the language is native English, avoiding 'false friends' (for instance, by using work on for elaborar). There's only one minor word that needed correction and it arose from an ambiguity: the Spanish term revista can mean either magazine or learned journal, and here the context suggests the latter. The bill for the two translations was $16, or about $0.053 per word, and it was payable by Visa. The price seems to me reasonable for the difficulty of the work and the time it needed. I wasn't told and didn't ask about the translator. Here, for purpose of comparison, is the same email translated by Google Translate. Google detected automatically that the source language was Spanish. The translation was instant, anyway too fast for me to measure. Hi Kiko: As I said on the phone, we think you're the best person to review a paper that we will send a magazine. The article we have developed three people and we believe that in some sections, you can tell the difference in wording. In addition to checking, we would like corrigieras what you think appropriate and give us your opinion, please. I will be "traceable" to the 29th, but next Monday and Tuesday I will not be. If you had a problem with the format, let me know and I'll send in the format compatible with Word 97-2003 Thank you very much for agreeing to perform this task, and is that January is not the best time to ask. A big hug for you both. Not bad! And Google Translate is free. The deficiencies in the English are obvious; nevertheless, the translation is understandable enough to convey the essential information. Note the opening and closing salutations: Hi, more familiar than Dear, and A big hug, much warmer than myGengo's Best wishes, both thereby closer to the Spanish in register and culture – but take your choice. Curious, though, that Google was completely stymied by a simple point of grammar like the conjugation of corregir. To be continued with the second experiment. Corrigieras illustrates a major limitation of MT systems like Google Translate, which work by statistical analyses of existing human translations – although statistical MT is very successful in other ways. Corrigieras is in a lesser-used, though by no means unused, subjunctive tense; and presumably there weren’t enough examples of it in the Google database for the statistical method to be applicable. The myGengo website is here. It's developed considerably since the experiments were conducted earlier this year. He is Japanese. He is excellent at French, and communication, that is, he speaks naturally, and fast, and understands a great deal about everything. Incidentally, he spent years as a barman in a café back there [in France?]. He is new to translation and interpretation. He has been working part-time as a kind of assistant for a veteran terp/translator. This is a reminder of an alternative route for progressing from Native to Expert Translator – an alternative, that is, to taking formal courses. The definition of Expert Translator on this blog (enter essential definitions in the Search box on the right) expressly recognises mentorship as that alternative. Another word for it is apprenticeship, which of course is very old. It's not peculiar to translation, though other professions have it better organised. My brother was an engineer. He began his career when he was 16 as an apprentice in a large firm of manufacturing engineers in England. At the same time he went to night classes, and he finished up as a partner in a famous firm of consulting engineers. He didn't have a university degree, but he had a series of professional qualifications obtained by examination from the Institution of Structural Engineers. He told me that times had changed in his profession, however, and that nowadays engineers at his level were expected to have a degree, especially since the UK joined the European Union and the British norms had to adapt to it. There were pros and cons. On the one hand, the university graduates were well prepared on the theoretical side; but on the other hand they lacked practical experience and judgement and still needed another kind of 'apprenticeship' before they became full operative and responsible. Administrative and technical translating, at least in the more 'developed' countries, has been going the same way over the past 50 years. Here's an example. When I started teaching in the 1960s, the executives at the Translation Bureau of the Government of Canada looked down politely on a university degree in translation and didn't consider it a worthwhile qualification. (According to Sarah Dillon, see References below, the attitude persists in some quarters.) To understand them, one must recall that they themselves came from a generation that started in translation when such degrees were a novelty and only available in very few places. 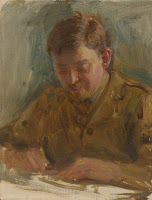 Instead, the Bureau recruited beginners by its own examination and placed them at the lowest rank in the service (TR1). There they were put to work under an experienced senior revisor (TR3 level) who, if he or she acquitted the role conscientiously, acted as a mentor. And nowadays? Like all the large employers of translators in Canada, the Translation Bureau asks for a degree. Elsewhere, there are now 19 universities in Spain alone that offer translation licenciaturas (roughly equivalent to Honours BAs). Sarah Dillon. Apprenticeships for translators. There's Something About Translation blog, 2011. Click here. 'Apprenticeship programs put learners under the direct supervision of the experienced'. Source: Apprenticeship Programs for Education in Washington. This report has just come in from Cincinnati, Ohio, in the heart of the American Midwest. It’s crunch time for the language volunteers of the 2012 World Choir Games. Bob Stevie, 65, of White Oak and president of the Cincinnati USA Sister City Association, began recruiting volunteers fluent in foreign languages a year ago. He started with three volunteers, and largely with the help of the University of Cincinnati’s international community, he has built a group of 60 leaders. Each leader, specializing in specific languages and dialects, has received a list of volunteers that they must then interview to make sure their workers are actually fluent. About 30 volunteer translators met last week in a Cincinnati Park Board office to hammer out plans for serving the melting pot of international choirs. They represented half of the volunteer team leaders who are meeting weekly to coordinate myriad details. Putting together a master plan for these teams of translators – who will assist international choirs as they rehearse and compete, help them find Downtown restaurants, and get them to their events on time – has been complex. During the meeting, there were signs of the urgency of their task. Team leaders were waiting for the final list of 352 choirs – half of them international – that will descend upon Cincinnati starting on July 4. Until they received that list, they couldn’t coordinate a master schedule for their volunteer workers. Rebecca Quinones of Loveland is helping to coordinate all of the languages. Introducing themselves around the table, the volunteer language coordinators were fluent in (besides English), Hindi, Spanish, Russian, Ukrainian, German, Italian, Norwegian, Chinese (both Mandarin and Cantonese), Latvian, Dutch, Japanese, French, Brazilian Portuguese, Thai, Swahili and Arabic. A second weekly meeting with different leaders includes a host of Chinese speakers of several dialects, as well as those overseeing Czech, Danish, Hebrew, Bosnian, Croatian, Hungarian, Romania, Farsi, Kazakh, Filipino Tagalog, Polish, Turkish and Vietnamese translators. They are prepared to cover 27 languages, and possibly more if the need arises, said Stevie. On their table, a large map of China pinpointed the provinces representing 60-70 Chinese choirs that are expected. Each leader voices a concern. Volunteer Hanif Qureshi, a police officer from India working on his Ph.D. at UC, says he needs to know the regions that the three choirs from India are from. “The region will say which language they speak. They will not all speak Hindi,” he said. The Russian committee is still “a work in progress.” There are not enough native Latvian speakers locally to cover the need. There is just one Japanese choir, but 13 volunteers to cover it. In contrast, only about a dozen people have been found who speak Indonesian, and more than 900 Indonesian singers in 20 choirs are expected. Indonesia is a country where up to 700 different languages are spoken. Fortunately, said Stevie, many speak English. Stevie instructs the group that they must all be familiar with Downtown streets. 1. This is a typical case where the number (27) and nature of the languages and the type of organisation responsible would make it unthinkable to employ professional interpreters, even if they could be found in the Cincinnati area. 2. It's a large-scale operation. Just the group leaders number 60. This is evidence - if more evidence were needed - that translating is not an accomplishment of the exceptionally endowed but is commonplace in bilinguals, at any rate in well-educated ones. 3. Universities, even those that have no translation programme, are a good source for recruiting Native Translators and Interpreters, because nowadays they all have many bilingual foreign students. 5. The volunteers may not be Expert Interpreters, but they are tested for language fluency and are well organised. 6. They can count on a lot of goodwill and tolerance on the part of their 'clients'. 7. There's a convergence that illustrates the parallel between translators and musicians that was the subject of the post of May 10. 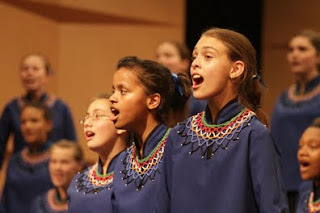 The interpreters are Native Translators and the choristers are, for the most part, Native Singers. Janelle Gelfand. Choir Games translators talking details. Cincinnati.com, June 10, 2012. Click here. The website of the World Choir Games, "the largest choral competition in the world", is here. World Choir Games 2010. Source: ChoralNet. I told this story at Forlì, but I'll repeat it here for a wider audience because it follows appropriately on the post about note-taking. It comes from the memoirs of one of Hitler's interpreters, Eugen Dollmann, who was his principal Italian interpreter. Dollmann's performance on his first assignment was far from auspicious, but the story has a happy ending – if working for Hitler can be called 'happy'. In brief, it happened this way. Hitler had come to Italy to visit Mussolini and was to address a meeting of Italian fascist youth. The man who was to interpret for him fell ill suddenly, and the German embassy in Rome was faced with finding a last-minute substitute. So they turned to Dollmann, a German who had been living in Rome for several years and who was known to speak Italian fluently. He was a student of Italian history and art; however, he was not an interpreter. He had neither training nor experience. But he couldn't turn down an assignment for the Führer. So Dollmann was introduced to Hitler, the youth meeting took place, and at the end of it Hitler made one of his bombastic speeches. Then it was Dollmann's turn. But poor Dollmann, who had no notes to fall back on, couldn't remember a word of what Hitler had said. So in a panic he did what others have done in such a situation: he 'winged it', as interpreters say. He concocted a speech of his own in Italian in the same style as Hitler's, and delivered it with as much conviction as he could muster. At the end of it, to Dollmann's surprise and relief, the young fascists applauded and cheered wildly. So Dollmann thought his ordeal was over, but no. To his dismay, he was told he would be driving back in Hitler's own car. He got in, wondering whether Hitler realised what had happened, and after a while, sure enough, the Führer said to him sternly, "Herr Doktor, it seems to me you didn't say quite what I said." Dollmann's heart sank into his boots. And then Hitler continued, "But never mind. They liked it." Not only was that an end to the incident, but Dollman and Hitler hit it off and Dollman, by then an SS officer, continued to interpret for the Führer and Mussolini until the end of the war. By that time, we may suppose, he'd progressed from Native to Expert Interpreter. He even carried out diplomatic missions in Rome. An American who had dealings with him called him "a slippery customer." Not only that, but like Hitler's English interpreter Paul Schmidt (for more, enter schmidt in the Search Box on the right), he escaped prosecution and survived to write his memoirs, which have been an invaluable source for historians. "The worst thing an interpreter can do is to say nothing. Then everybody knows at once that things have gone wrong. If you keep talking but say something the speaker didn't say, only bilingual listeners will notice it. Make it up if necessary. But if you do that, make sure it's something the speaker might have said. Then there's a good chance nobody will notice." Eugen Dollmann. The Interpreter: Memoirs of Doktor Eugen Dollmann. Translated from German by J. Maxwell Brownjohn. London: Hutchinson, 1967. The above version of the story is a paraphrase from memory, because I don't have my copy of the book with me in Valencia. Robert Katz. The talented Doktor Dollmann. TheBoot.it: Robert Katz's History of Modern Italy. Originally published in 1967. Click here. 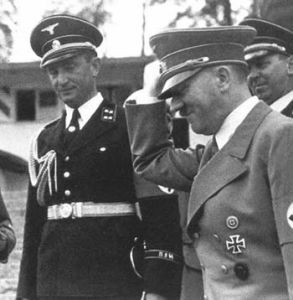 Dollmann in SS uniform with Hitler. Source: Il Bracciale di Sterline. "Having a notepad doesn't make you a professional interpreter. Some amateurs will use it as well because it's simply practical." She has a point. In the set-up shown in the photo, however, it's more than just a notepad. There we have two interpreters, both with notepads of the right size at the ready and both seated in the correct position. The notepads are an indication of expertise but not the only one. I agree that some Advanced Native Interpreters (the ones Barbara calls 'amateurs') know how to take notes. In my experience, it's because they've already learnt note-taking for some other purpose. The first time I ever had to do long consecutive in public, it was of a speech at a banquet. I'd had no interpretation training, yet I intuitively had the good sense to make some notes on the only 'pad' available, which was the back of the menu. How was it that I knew to do it and how to do it? It was because I'd had a long training in summarising, starting with précis-writing at school, which was a standard exercise in my time, and then of note-taking at lectures at university. One of my best consecutive interpreting students – he's now a senior United Nations official in Geneva – had previously acquired experience as the secretary at meetings. Neither he nor I started out using a system of symbols such as Rozan's; that came later, and then only partially. In short, note-taking is part of a complete education for working life in our society, and "summary/précis writing is a useful skill for everyone." On the other hand, I've seen Native Interpreters stumble over even very short consecutive passages because they hadn't been told to take notes or hadn't come along with the right equipment. ('The right equipment' means a flip-over shorthand secretary's pad and two good pens because, in a long meeting, one may give out.) It's particularly embarrassing when inexperienced court interpreters have difficulty remembering names, numbers, etc. ; those are the first things they should note. 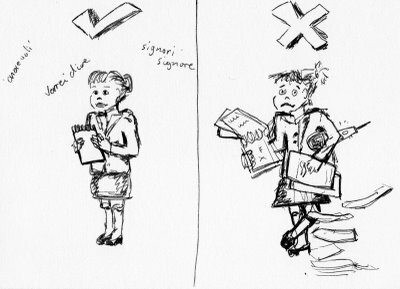 And most students in interpreter training courses at university or elsewhere need some instruction and exercises in note-taking, bearing in mind that the translation for conferences should be shorter than the source. Yet I've also witnessed a 15-year-old untrained schoolgirl produce a stunning expert performance at a simulated meeting. Consideration of note-taking leads to some deep questions. On the one hand there's the outward notation for it: the abbreviations, symbols, speedwords, etc. On the other hand, hidden behind that, there's the human mental ability to select and extract information, to synthesise it and to summarise. We schoolchildren already needed the last for our précis exercises; grown academics need it for writing abstracts; and so do the bilingual Précis Writers at the United Nations meetings in New York, who don't share the high profile of their interpreter colleagues but who are likewise highly skilled Expert Translators. Thank you, Barbara, for the comment. Interpreting notes. Wikipedia. Click here. United Nations Language and Comunications Programme Learning Service, OHRM. Summary and précis writing, Course Code E4W45/1. From the blog Travels without my spaniel. Click here. I'm back from the Forlì conference, having spent a few days on the way in the beautiful old city of Bologna. Apart from its buildings - we visited three churches each the size of a cathedral - it boasts the oldest university in Europe, founded in 1088. At 4:05 am on May 20 we were wakened by the first of the two earthquakes that have hit the region. But the tremor only lasted a matter of seconds, the hotel shook but settled back to stability, so we went to sleep again and only learnt about the damage elsewhere the next morning. Fortunately for us and for the city, the epicentre was some distance away (Bologna is a province as well as a city) and in the city itself life went on as usual. "I think that having a conference where we can all present and discuss our research in this field without being relegated in sessions that have little to do with our work was something that we all enjoyed and treasured, and certainly an experience to be repeated." For me, it was a particular pleasure to meet some of the readers of this blog in person. That said, it's also noticeable that the spread was far from even. Of the 60 participants, all but six were from Europe. That's easily explained, of course, by logistics and cost. Low-cost airlines have revolutionised travel within Europe. There are days when you can fly from Valencia to Bologna for 10 euros plus tax! For people from afar, perhaps the future lies in streaming conferences by internet - but then we wouldn't have the pleasure of meeting like-minded people in person. And the topics of the papers likewise showed an uneven distribution. We can't yet say that non-professional translation studies are in fashion, but they have their own fashions. One is language brokering, whose relative popularity has been, as Marjorie Faulstich Orellana showed in her paper, mainly due to people from other disciplines like sociology. There were 10 papers on child language brokering (CLB). Only one, a 'spin-off' to quote its author, was on language brokering by adults; although there were one or two others that might be classed with it even if they didn't use the term. In part the imbalance in this case can be attributed to the fact that the Forlì people have their own CLB research project, called In medio PUER(I), and that “CLB is extremely common among all the linguistic groups living in Emilia Romagna” (the region around Forlì). Another prolific subfield was crowdsourcing, especially for subtitling videos and films (aka fansubbing). There were eight papers on this theme. The activity itself is now very widespread. In contrast, some equally important fields were under-represented. Religious interpreting and translating brought only two papers. And there was only a single paper - a historical one at that - about military interpreting, something that was surprising given all that is known about the interpreters in Iraq and Afghanistan. Hopefully these imbalances will be redressed in future conferences. Anyway, there was a lot to be learnt at this pioneer meeting and some of it will be taken up here in coming posts. The title of the conference was non-professional interpreting and translation. This roughly corresponds to natural translation in its broad sense, i.e. the translating done by people who have had no specific training for it. (For the narrower sense, enter essential definitions in the Search box.) In fact natural translation was widely used in the broad sense in the papers, so it seems to be established. Child language brokering. This term, along with its abbreviation CLB, was also so much used that it's clear it's become established. That's a good thing because it leaves an earlier version of it, language brokering without the child, free for a broader meaning that also covers the language brokering done by teenagers and adults. Rachele Antonini. The study of child language brokering: Past, current and emerging research. mediAzioni 10, 2010. Click here for the text. The conference programme is still available here. 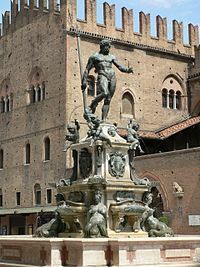 The Neptune fountain, Bologna. Source: Wikipedia.